1563: William Harley, Clarenceux King of Arms, is content in his life. As a herald of England, he has had the opportunity to travel the continent and has enjoyed the privilege and relative safety of a gentleman. He has a nice home on London’s Fleet Street, a loving wife, two beautiful young daughters and a library full of the books he loves. While the current Queen Elizabeth’s Protestant beliefs are at odds with his Catholic faith he keeps quiet to avoid the taint of treason that so many Catholics fear. For a charge of treason can mean a ruined reputation, all lands, properties and titles taken and even death, not only for the one accused but their loved ones as well. It seems much safer to practice his faith quietly then bring attention to himself and risk the enmity of the crown. One cold, rainy December night this cozy life is put to the test when Clarenceux, as Mr. Harley is known to everyone, receives a knock on the door. Henry Machyn, a merchant taylor, funeral arranger and parish clerk acquaintance of Clarenceux’s, is distraught, shaken and adamant that his life is in danger and he needs Clarenceux’s help. He cryptically asks Clarenceux to keep his chronicle safe when he is gone, a chronicle detailing all that Machyn has witnessed over the last thirteen years. Along with this he gives Clarenceux instructions to visit a man named Lancelot Heath upon Machyn’s death and that he will need to give Lancelot a false name and specific date. Terrified that Machyn is involving him in something treasonous Clarenceux presses him further regarding what this chronicle really is. However the more coded information Machyn gives the more questions Clarenceux has, until it becomes evident to him this must be a test of his faith and he has to accept it. Right before leaving Machyn tells him he alone can discover the true secret of the chronicle and that he will need to find and bring together all nine of the “Knights of the Round Table” and discover each of their secret names and specific dates to uncover it. Then he is gone into the night and the real test of Clarenceux’s faith begins. As Clarenceux reads through the chronicle he becomes even more confused. The log appears to be nothing more than an account of Machyn’s day to day actions and observances, ones that seem eerily to involve Clarenceux more than any other. When he goes in search of Machyn to figure out what this chronicle and its secret has to do with him he discovers Machyn is missing and his house is under guard. Shortly after he receives a visit from Machyn’s wife, Rebecca, and Clarenceux is arrested on suspicion of treason and his house is ransacked by a royal sergeant-at-arms and his men who are looking for the chronicle. Rebecca is able to escape with the chronicle right before the men can find it but Clarenceux’s house is destroyed and one of his servants is murdered. He now knows he must discover the secret behind the chronicle to clear his name, revenge the destruction and death brought about under royal instruction and to keep him and those involved alive. What he doesn’t at first realize is that two of the most powerful men in England - Sir William Cecil, the Queen’s principle secretary and most trusted advisor, and Francis Walsingham, Cecil’s Chief Counselor and the Queen’s “spymaster” – are determined to find the chronicle and discover its secrets first and they are willing to do anything to make that happen. So begins the adventure of a lifetime. With Rebecca Machyn’s help Clarenceux sets off to find each of the Knights of the Round Table and discover what secrets they hold to help unravel the mystery connected to this seemingly benign chronicle. Through continued attacks, murder, betrayal and utter devastation they must hold on to their faith and the constant hope for the future to persevere even when all seems lost in order to discover the secret that could change the course of history for two queens. Sacred Treason is a brilliant mystery adventure set in one of my favorite places – Tudor England. James Forrester is able to keep the suspense and tension palpable across the over 450 pages, a feat not easily done. Seamlessly incorporating known facts and people of the time with fictional aspects to progress the story, the many secrets and connections between the various characters are slowly released until the truth literally jumps out at you right towards the end. I was completely surprised with the discovery of the chronicle’s ultimate secrets which is quite impressive as so often these sorts of stories are easy to unravel long before the ending. There are just so many twists, hidden truths and character connections that there is nothing to be done but to keep turning the pages. This being the first of a trilogy of stories, I am happy to say that some secrets are still left to be discovered in the subsequent books, such as the identify of one of the Knights of the Round Table, known only as Sir Percival. 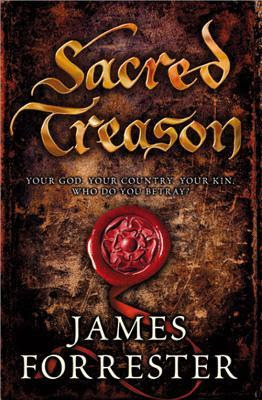 Sacred Treason is James Forrester’s first novel but many fans of history will know him as bestselling author Dr. Ian Mortimer, historian and author of such celebrated works as The Time Traveler’s Guide to Elizabethan England. Even without yet having read one of Dr. Mortimer’s historic nonfiction books it is not hard to see that he is an exemplary researcher and skilled writer. The author notes for Sacred Treason go into the research that brought about the idea for the book and the facts contained within. My only complaint at all is that it seems it will take some time for me to get my hands on the next two books in this series – The Roots of Betrayal and The Final Sacrament – as they don’t seem readily available here in the US. I will definitely be keeping an eye out for them releasing and will start reading some of his nonfiction in the meantime. A must read for historical fiction lovers and especially for those that devour Tudor stories. James Forrester is the fiction-writing name (the middle names) of the historian Dr Ian Mortimer - best known as the author of 'The Time Traveller's Guide to Medieval England'. He is the author of the Clarenceux trilogy, set in Elizabethan England: 'Sacred Treason' (set in December 1563), 'The Roots of Betrayal' (May 1564) and 'The Final Sacrament' (December 1566-February 1567). The central character in these novels is William Harley, Clarenceux King of Arms, a herald in the College of Arms. Ian-James lives with his wife and three children on the edge of Dartmoor. Find out more about his writing as James Forrester at www.jamesforrester.co.uk. Thanks to Sourcebooks I have one copy of Sacred Treason up for grabs! Treason sounds like a great read! Sounds like a good read !!! My type of book.fb follower twitter follower @rhondareads. Lomazowr@gmail.com will share on fb. You don't need to enter me in - I'm reviewing it later in the month. It sounds so exciting! What an exciting sounding story. Thx 4 the chance! Sounds like an excellent read!! I would love to read this Amy pls enter me! I am a follower here as well as on your fb page! I've waiting for this one to come out...love The Crown. I'm an email follower. Thanks for the giveaway. This book looks absolutely wonderful! I love historical mystery! I follow you everywhere! Twitter, FB you name it I follow. AMy, I would love to win a copy of The Sacred Treasure. Please enter me in the giveaway. Thank you. I follow on facebook, the internet and email. I'm looking for a good historical novel to read - this looks like a good one. Thanks for the giveaway! Wow, this sounds absolutely brilliant! Thanks for the chance to win it! Wow, sounds like an awesome book. Sad that I missed the giveaway time. Ill be adding this to my need-to-read list. Thanks!